Remembering to Remember | "Northern Crossings"
There is so much to think about as we enter the season of the year that revolves around Advent and Christmas and as we wend our way that way, that we sometimes forget the commemorations that come through this time of the year as well. Last week was very busy with many in the hospital, many folks who have fallen and broken bones plus all the preparation of the season. Preachers get so busy this time of the year it might be well for them to remember that Pastors down through the years have been memorialized and remembered for their labors. I pieced this together from different articles. December 4 John of Damascus – John (ca. 675–749) is known as the great compiler and summarizer of the orthodox faith. Born in Damascus, John gave up an influential position in the Islamic court to devote himself to the Christian faith. He was also a good hymnwriter – “Come You Faithful Raise the Strain” is one of my favorites and I really love the line “led them with unmoistened foot”. December 6 Nicholas of Myra, Pastor. Of the many saints commemorated by the Christian Church, Nicholas (d. A.D. 342) is one of the best and least known. Legends about Nicholas have traveled throughout time and space. 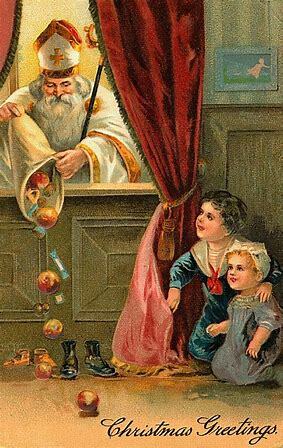 In commemoration of “Sinte Klaas” (Dutch – English “Santa Claus”), December 6 is a day for giving and receiving gifts in many parts of Europe. December 7 Ambrose of Milan, Pastor and Hymnwriter. Born in Trier in A.D. 340, Ambrose was one of the four great Latin Doctors of the Church (with Augustine, Jerome, and Gregory the Great). He was a prolific author of hymns, the most common of which is Veni, Redemptor gentium (“Savior of the Nations, Come”). His name is also associated with Ambrosian Chant. Clarity of Luther – part 2 on Missions.